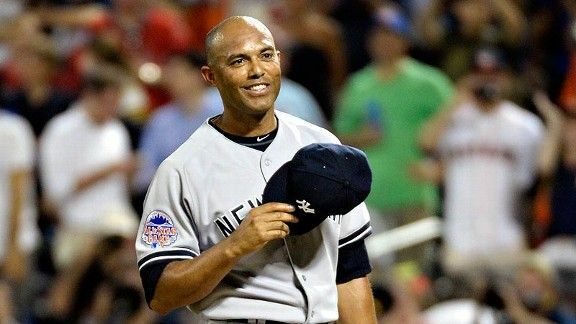 In Mariano Rivera's final All-Star Game, pitching ruled the day. Pitching, pitching and more pitching was the dominant statistical storyline in the 2013 MLB All-Star Game. This year’s contest was, like last year’s, a shutout, marking the first time in All-Star Game history that consecutive games were shutouts. The three runs scored were the fewest combined by the two teams in an All-Star Game since 1990, when the AL won 2-0. The teams combined to hit .197 with the NL managing only three hits, tied for the second-fewest in an All-Star Game. With the win, the AL will hold home-field advantage in this year’s World Series. Let’s run through some of the highlights. Mariano Rivera won MVP honors, which wasn’t so much for this game (in which he pitched a scoreless eighth inning), but was more of a lifetime achievement award to commemorate his great career. Rivera pitched nine innings in his All-Star career and allowed one unearned run. The only pitcher to pitch more All-Star innings without allowing an earned run was Mel Harder, who pitched for the Cleveland Indians in the 1930s and 1940s. Rivera got a “hold” in this game and not a save. His four All-Star Game saves are the most all-time. Rivera is the first pitcher who was primarily used by his major league team as a relief pitcher to earn All-Star Game MVP honors. He’s the second to pitch in relief in the game and earn MVP, joining Jon Matlack, a starter on the 1975 New York Mets who shared MVP honors in that year’s All-Star Game. Rivera is the first pitcher to win All-Star Game MVP since Pedro Martinez in 1999 and the second Yankees player to win it, joining Derek Jeter in 2000. Elias notes that he’ll join Cal Ripken Jr. as the only players to win All-Star Game MVP in their final seasons. NL starter Matt Harvey, the first New York Mets pitcher to start the All-Star Game since Dwight Gooden in 1988, looked sharp after letting the first two hitters reach base. He was the first Mets pitcher to throw two scoreless innings in an All-Star Game since Gooden in 1984. Harvey continued a run of dominance by Mets pitchers making their All-Star debuts. The 11 pitchers have combined for 12 2/3 scoreless innings, with 20 strikeouts. White Sox pitcher Chris Sale earned the win. He was the first AL pitcher to throw two perfect innings in an All-Star Game since Roger Clemens in 2001. He’s the first White Sox pitcher to win an All-Star Game since Mark Buehrle in 2005. Miami Marlins pitcher Jose Fernandez struck out a pair of hitters in the sixth inning to become the third pitcher age 20 or younger with multiple strikeouts in an All-Star Game, joining Gooden (1984) and Hall of Famer Bob Feller. The combined line for those three -- five innings pitched, one hit allowed, seven strikeouts. The trio has 93 career starts between them. The AL benefited from a couple of nifty examples of teamwork en route to the win. Jhonny Peralta, Prince Fielder and Miguel Cabrera each had at least one hit in the game. It’s the first time that the Detroit Tigers have had three different players get a hit in an All-Star Game. On the pitching side, Toronto Blue Jays relievers Brett Cecil and Steve Delabar combined for the last two outs of the seventh inning by striking out left-handed hitting Domonic Brown and right-handed hitting Buster Posey. Cecil has held lefties to a .154 on-base percentage this season, the lowest for anyone in the majors this season. Delabar has struck out 150 batters in 108 innings over the last two seasons. His rate of 12.5 strikeouts per 9 innings is eighth-best in the majors in that span. The NL finished with only four baserunners, the fewest in a game for either team since 1995 and the fewest for the NL in an All-Star Game since 1968. The AL grounded into an All-Star Game-record four double plays. Joe Nathan recorded the save. The only other Rangers pitcher to record a save in an All-Star Game was John Wetteland in 1999. You might remember Wetteland as the pitcher who preceded Rivera as Yankees closer.